John Pfannenstiel of Ness City is averaging 22 points per game in 2017-2018. 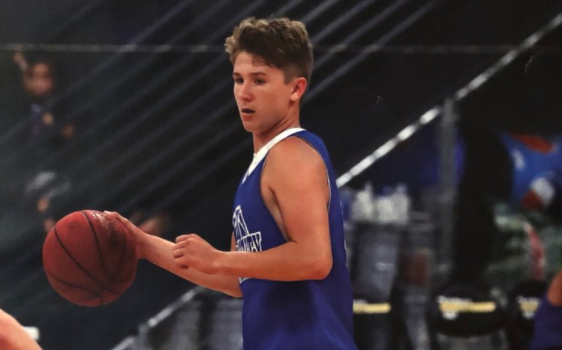 When it comes to young, up and coming, small school talent in the state of Kansas, one of the best in the state may be Ness City junior John Pfannenstiel. He's probably a player you haven't yet heard much of but that won't be for long as he has opened some eyes over the first part of the 2017-2018 season for the Eagles. Pfannenstiel, a 6-foot-1, 170-pound, junior, point guard, is averaging 22 points per game, five assists, three boards, and 2.5 steals per game for NC in 2017-2018. He also has his team off to a 7-2 record and number eight ranking in the latest 2A Kansas Basketball Coaches Association (KBCA) Poll that was released on Monday. As a sophomore he was an All-CPL pick in basketball averaging 15 points per contest and seven assists. Pfannenstiel lives in the gym and has been involved with the sport from a young age. He learned to love the game of basketball with his dad, who played college basketball at Dodge City CC, in the driveway all night going over dribbling and shooting drills. He was also the 2013 Kansas State Champion in free throws as a sixth grader just five short years ago. "As far back as I remember I have had a ball in my hands. My family was very involved with sports. We would be in the driveway all night long playing basketball from the time I was little." Pfannenstiel said. Being from a small school means you play all the sports and that Pfannenstiel does. He is also the quarterback on the football team and throws the javelin in track and field, placing eighth in the state as a sophomore last spring in Wichita. In your typical small town in Kansas, sports mean a lot and that's no different in the town of Ness City, which is just around 1,400 people. Everyone knows everyone in the small Western Kansas town. It's what Pfannenstiel describes as a blessing to grow up in. "Everybody knows just about everybody and people of Ness are always very supportive and passionate about what we do on the court and on the field." Pfannenstiel said. Pfannenstiel will look to make Ness City proud this season and in the future at the college level. For now he is only worried about one thing and thats the 2017-2018 season as he looks to get the Eagles back to the 2A state tournament in Manhattan this March. Last season Ness fell in the first round to Bishop Seabury and graduated the highly talented Chandler Stiawalt, an all-state selection last year, that is now jumping in track and field at Wichita State University. The Eagles will have a challenging sub-state at the end of the year that also features league rival Central Plains and Pratt Skyline. What makes this small school player such an up and coming player? Find out as we caught up with the talented junior below in the latest edition of Faces in Kansas. As far back as I can remember I have had a ball in my hands. My family was very involved with sports with my dad playing college basketball at Dodge City Community College and a few uncles playing college football, I just fell in love with sports, especially the game of basketball at a very young age. I remember back to grade school during the summer, my dad and I would be out on the driveway all night going over and over dribbling and shooting drills. To this day both my mom or my dad will go over with my almost every night to get some handle work and some shots up on the shooting machine. To get back to the state tournament in Manhattan and take care of business once we get there. Coach Rogers is really a great coach to play for. I’ve only known him for about 8 months now but we have developed a very close bond on and off the court. He’s a great coach on the court and a great person off the court. He knows my potential and pushes me each and every day to reach that potential and be even better. What style of player are you, what are your strengths and weaknesses? I see myself as an all-around playmaker and scorer. I have the tools to score at all three levels on the court, whether that be beyond the arc, mid-range, or making a move and getting into the lane. My ball handling skills have really provided opportunities to create space for a shot for me at anytime or be able to get by and score or dish off to my teammates. My passing ability really comes from be being able to see the floor and see where people are going to be before they are there and being able to put the ball in a position for my teammate to score. Leadership, knowledge, and feel for the game would also be some of my strengths. Putting too much pressure on myself at times would be one weakness I have and there is always something to learn from. Plans at the next level and seeing any interest? Ever since I was a kid I had the dream of playing college basketball. I am now seeing that dream start to become a reality. This past summer, playing aau ball, I had multiple schools express their interest for the future. Being a junior I am excited to see what the future holds. Other key players on your team this year? I think everyone on this squad is going to be an important part to the success of this years team. Everyone has a role and each person knows what that role is. If every person can execute their role I think we will be a very tough team to stop. Best player you’ve played against and other key players you’ll face this season? I have played against a ton of really great players whether that be during the season, at the state tournament, or all around the country playing AAU ball. But a very good player we will face this season would be Brett Liebl out of Central Plains. He’s so fundamentally sound and can score anyway he wants down in the paint. I play football and do track and field. I play quarterback. We’ve made the playoffs the last two years and came up short in the first round both times to both very good teams. I throw the javelin and run the 800 in track and field. I made it to state in the javelin and took home a medal with an 8th place finish. I feel like it’s a blessing to be from Ness City. It’s a small town of about 1,200. Everybody knows just about everybody and people of Ness are very supportive and passionate about what we do on the court, and the field. My favorite subject would have to be my anatomy and physiology class. With me being so involved in sports and my mom being a physical therapist I have really gained an interest in the human body and how it works. I really don’t know where I’ll end up in 10 years. I just try to be the best that I can be now and each and every day and see where God’s plan takes me. My favorite place to eat in Ness City is Cuppa Joe. Everything is homemade and the people there are so nice.